A-HOTEL.com - Luxury and cheap accommodation in Verkhneye Uchdere, Russia. Prices and hotel, apartment booking in Verkhneye Uchdere and surrounding. Featuring free WiFi, Gayane Guest House offers accommodation in Loo, 300 metres from Loo temple and 1.2 km from the Black Sea. Offering free WiFi, ChernyChalet is situated in Loo. Boasting a 24-hour front desk, this property also provides guests with an outdoor pool. Situated in Loo, 700 metres from Loo temple, Royal Guest House features free WiFi access. A free parking is located in front of the property. Situated a 10-minute walk from the Black Sea in Loo, Provans-Loo Guest House features free WiFi access and free private parking. A free shuttle service to the beach is available upon request. Located in Loo, Guest House Akvarium Loo provides accommodation with private balconies. Built in 2015, the property is within 4. Offering a swimming pool, sun terrace and a private garden, Aloiza Lux Guest House is set in Loo, 10-minute walk away from a beach and 15-minute walk away from water park AquaLoo. All rooms have air conditioning, a fridge, a TV and a balcony. Featuring a seasonal outdoor swimming pool, U Dyadi Vovy is located in Loo, 4.2 km from Loo temple. 4.2 km from Loo temple, Voyage Guest House is located in Loo and has a seasonal outdoor swimming pool and free WiFi. Offering an outdoor pool and a sauna, Korall Hotel is set in Sochi, a 10-minute walk from the Black Sea shore. The rooms feature a balcony, air conditioning, fridge and flat-screen TV with satellite channels. Guesthouse Aida is set in Loo. Featuring a restaurant, the property also has a garden. Offering a barbecue and terrace, Zelenaya Gorka is set in Sochi in the Krasnodar Krai Region, 15 km from Rivyera Park. Free private parking and free WiFi are available on site. With barbecue facilities and a garden, Guest house on Eniseyskaya 13A provides accommodation with free WiFi. The units have a fully equipped kitchen with dining area, a microwave and a fridge. Volgar Guest House in Loo provides accommodation with a garden and a terrace. The property is situated 4 km from Loo temple. Boasting free bikes, terrace and free WiFi, Guest House Korol Lev is situated in Loo, 4 km from Loo temple. The accommodation offers a shared kitchen and a shared lounge for guests. Boasting barbecue facilities, garden and views of sea, Guesthouse Zhemchuzhina is situated in Loo, a 7-minute walk from Loo temple. Featuring a 24-hour front desk, this property also provides guests with a terrace. Set in Loo, in a building dating from 2016, Guest House U Emilya provides barbecue facilities and guestrooms with free WiFi. Built in 2016, the property is within 1. Surrounded by forest, this accommodation features a spa area with a Russian steam bath, hammam and massage service, a gym and an outdoor swimming pool. It is located in Loo on the Black Sea coast, 650 metres from the sea. 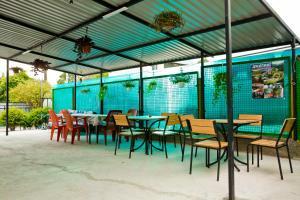 Guest House Vesna is located in Loo, 4.2 km from Loo temple, and has barbecue facilities. Morskoy Guest House offers accommodation in Loo. Free WiFi and parking are available.